I just discovered that Norwegian Qumran scholar Årstein Justnes was blogging about a seminar on this text as early as May. Personally, I'd say 5 is irrelevant until proven relevant, 4 is highly deplorable but hardly decisive, 1 and 2 could point either way (as my old teacher Fred Cryer used to say, "a new inscription that does NOT have oddities but is done strictly acc. to Gesenius/Kautzsch -- now, THAT's suspicious") -- but 3 is certainly interesting. Søren also has a post on the text is his own (Danish) blog, PergaMent. I've now skimmed through the Cathedra article and looked fairly carefully at the transcription of the text. The language is peculiar (1) and the text is pretty incoherent (2), but I would have to spend a lot more time on the inscription (more than I have to devote to it any time soon) before I would be willing to take a position either way on its genuineness. On the one hand, my default position is to be suspicious of unprovenanced inscriptions (4, 5), but on the other, Ada Yardeni is not a paleographer easily fooled by fakes (3). UPDATE (30 December): More here (next post). Let's cut to the chase, which Geraldine Brooks certainly does - repeatedly - in her intense, gripping new novel. "People of the Book," like her Pulitzer Prize-winning previous novel, "March," is a tour de force that delivers a reverberating lesson gleaned from history. "March," about the father in Louisa May Alcott's "Little Women," whose ideals are dashed in the Civil War, makes a passionate case for the moral and spiritual costs of war. "People of the Book" focuses on the pernicious persecution of Jews through six centuries, contrasting it with the wondrous occasions when Christians, Jews and Muslims cooperate. At the heart of Brooks' new novel is the Sarajevo Haggadah, a gorgeously illuminated Sephardic treasure dating to 14th century Spain and used during Passover seders to tell the story of the Jews' exodus from Egypt. Brooks first learned of the rare Hebrew codex while in Sarajevo covering the Bosnian war as a correspondent for the Wall Street Journal. After the war, it was revealed that the Haggadah had been rescued from the National Museum by a Muslim librarian during heavy shelling, and hidden for safekeeping in an underground bank vault. In an afterword, Brooks notes that this was the second time the Sarajevo Haggadah was saved by a Muslim in the 20th century: In 1941, an Islamic scholar - the subject of Brooks' recent New Yorker article, "The Book of Exodus" - hid the volume from pillaging Nazis in a mosque in the mountains for the duration of the war. Taking her inspiration from these two feats of cross-cultural heroism, Brooks fabricates a compelling, multicultural history of the codex and the people behind it. She hangs all this, cleverly, on a fictional, snappy young Australian book conservator named Hanna, who is called to Sarajevo in 1996 to restore the manuscript. While working on the Haggadah, Hanna retrieves various artifacts from its ancient binding and parchment - an insect wing fragment, a white hair, wine and salt stains - which provide clues to the book's provenance. In alternating chapters, the story moves back in time, and we meet the people Hanna has become obsessed with, the "people of the book, the different hands that had made it, used it, protected it." Among them is Lola, a young Jewish girl in World War II-era Sarajevo who fights with the resistance and is ushered to safety (along with the haggadah) in the mountains by Serif Kamal, the Muslim librarian of the National Museum; an anti-Semitic, syphilitic book binder and his Jewish doctor in 1894 Vienna; the alcoholic, conflicted priest who saves the book from being burned in 1609 Venice; a young girl whose family suffers terribly during the Spanish Inquisition; and, in 1480 Seville, we finally meet the mysterious illustrator of the beautiful codex. All of these sections are richly imagined, almost unbearably tense, and tackle, sometimes obliquely, other times directly, the issues of exodus, marginalization, and brutality during periods of extreme nationalism: the Alhambra Decree, the Waidhofen Manifesto, the Venetian Ghettos, National Socialism, just to name a few. Arcing over these various set pieces, and holding it all together, is the story of Hanna's antiquarian sleuthing, which is much more exciting than it has any right to be. Who knew that "because parchment is flesh, human bacteria can degrade it"? Or that a single cat hair could serve as a paintbrush? Or that there's an actual instrument known as a "video spectral comparator"? The Sarajevo Haggadah is handwritten on bleached calfskin and illuminated in copper and gold. It opens with 34 pages of illustrations of key scenes in the Bible from Creation through the death of Moses. Its pages are stained with wine, evidence that it was used at many Passover Seders. It is considered to be the most beautiful illuminated Jewish manuscript in existence and one of the most valuable books in the world. In 1991 it was appraised at US$700 million. The Sarajevo Haggadah has survived many close calls with destruction. Historians believe that it was taken out of Spain by Spanish Jews who were expelled during the Inquisition in 1492. Notes in the margins of the Haggadah indicate that it surfaced in Italy in the 1500s. It was sold to the National Museum in Sarajevo in 1894 by a man named Joseph Kohen. During World War II, the manuscript was hidden from the Nazis by the Museum's chief librarian, Dervis Korkut, who at risk to his own life, smuggled the Haggadah out of Sarajevo. Korkut gave it to a Muslim cleric in Zenica, where it was hidden under the floorboards of either a mosque or a Muslim home. During the Bosnian War of the early 1990s, when Sarajevo was under constant siege by Bosnian Serb forces, the manuscript survived in an underground bank vault. To quell rumors that the government had sold the Haggadah in order to buy weapons, the president of Bosnia presented the manuscript at a community Seder in 1995. Afterwards, the manuscript was restored through a special campaign financed by the United Nations and the Bosnian Jewish community in 2001, and went on permanent display at the museum in December 2002. Recently, the museum has authorized the publication of a limited number of reproductions of the Sarajevo Haggadah, each of which have become collector's items. In May 2006, a Sarajevo publishing house announced the forthcoming publication of 613 copies of the Haggadah on handmade parchment that attempts to recreate the original appearance of the 14th century original. There is a brief mention of the manuscript in the motion picture, "Welcome to Sarajevo". The book "People of the Book" by Geraldine Brooks creates a fictionalised version of the history of the Haggadah from its origins in Spain to the museum in Sarajevo. The book had very turbulant history. Here we would like to describe how it had been saved during WW2 from the Nazi Germans. At that time (1941-1945) Sarajevo belonged to Independent State of Croatia (NDH), and director of the Sarajevo Museum was JOZO PETRICEVIC, a Croat. When German troups entered Sarajevo in April 1941, the Museum was visited by a German general Fortner, who ordered to bring Haggadah immediately. - But mister general, - said Petricevic - one of your colonels came yesterday and carried off the book. - What was the name of the colonel? - asked the suspicious general. - We were not allowed to ask his name. - answered Petricevic recourcefully. The German general, whose intention was to take the book by force, ordered to search the Museum. The Haggadah was already hidden by Petricevic and his colleagues. Of course, Petricevic risked his life during the whole WW2 period, hiding the book from the eyes of German officers. It is not excluded that Petricevic collaborated with local Sarajevo NDH officials in doing so. And there are a couple of nice, enlargeable images at this Yale University Library site (scroll down). UPDATE: Another review, in the Rocky Mountain News. UPDATE (6 January 2008): More here. Whether at some level the comments represented his actual views is debatable. What is incontrovertible, however, is that he maintained good relations with several Jewish and Israeli scholars, some of whom signed a letter in support of him, which was published in the Chicago Tribune. Emanuel Tov, who succeeded him as editor-in-chief of the Dead Sea Scrolls, continued to visit him and speak kindly of him in later years. His loudest critics were people who did not know him well, if at all. His colleagues and students, Jewish as well as Christian, testified that he was without personal malice, and that he was unfailingly generous and helpful to them regardless of their religion and ethnicity. Strugnell was not a prolific scholar, but he had enormous influence on his field. In part this was through the students he trained. But he was also involved in the initial publication of some extremely important texts, which revealed aspects of Ancient Judaism that were previously unknown. These included the Songs of the Sabbath Sacrifices (Shirot 'olat ha-Shabbat, an important document of ancient Jewish mysticism); an unpublished Halakhic Letter from Qumran, later known as 4QMMT (from the Hebrew Miqsat Ma'asei ha-Torah; an important document of early Jewish legal interpretation) with Elisha Qimron; and a large wisdom (sapiential) text known as 4Q Instruction with Daniel J. Harrington. UPDATE: The name is spelled correctly in the print version. M. R. JAMES has been terrorizing Iyov this holiday season. A few of the many PaleoJudaica posts on James are here, here, and here. I fully agree with Iyov about reading material for this time of year, "when darkness reigns over the Northern hemisphere," but let me remind you of an additional suggestion or two I made a couple of years ago. Those interested in Judaism and its history may enjoy a class that will be taught by Rabbi Julie Danan at Chico State University next semester. The course, "Rabbinic Judaism: Talmud and Midrash," concerns how Judaism changed between the first century and the end of the sixth century. "After the destruction of the Temple in the year 70, Judaism changed from a religion of temple, sacrifices and priests, to a religion of synagogue, prayer and rabbis," Danan wrote in an e-mail, describing the course. "Torah study and good deeds became the major values. The rabbis and sages of the first few centuries of the Common Era shaped Judaism as we know it." Danan is the rabbi at Congregation Beth Israel in Chico. She is also a lecturer at Chico State. A "HELLENISTIC STUDIES CENTRE IN ALEXANDRIA"
WITH A capacity of eight million volumes, the Library of Alexandria will host a Centre for Hellenistic Studies as of 2008. The Alexander S Onassis Foundation and the Vardinoyannis Foundation will share the centre's funding as part of their efforts to boost Greek culture abroad and promote the history of the Hellenistic era, during which the ancient library was created. "We are glad that our agreement coincides with the fifth anniversary of the library's opening and with the recent visit to Greece of Egypt's President Hosni Mubarak, who is also the library's greatest supporter," Marianna V Vardinoyanni, Unesco goodwill ambassador and member of the board of directors of the Library of Alexandria, told a press meet on December 17. Vardinoyanni pointed to the library's central role in ancient times, as well as its function as a cultural bridge between Greece and Egypt. "The ancient library was a meeting point for leading intellectuals and scientists for a period of seven centuries, while maintaining its strong ties with Greece and its culture. Greek was the main language used. It was at this library that the Old Testament was translated for the first time from Hebrew into Greek... And the Macedonian descent of its founder, Ptolemy, underlines the distinct relationship between Greeks and the library and by extension the longterm friendship and collaboration between Greece and Egypt," she said. This is good news. I think it's interesting and rather a good sign that the politics of the establishment of this Centre allow for the prominent mention of the translation of the Jewish scriptures into Greek in Alexandria. ANOTHER JOHN STRUGNELL OBITUARY, at the Harvard Divinity School website. THE STORY ON THAT ANCIENT IRAQI CHURCH is picked up by APF. The article is the same, but there are more photos. According to Professor Dan Bahat, former district archeologist of Jerusalem, who supervised most of the major excavations in the city for 15 years, various discoveries may not absolutely "prove" the truth of the Bible stories they seem to support, but "they do help illuminate the Bible." Bahat was in St. Louis last week, where he gave two lectures, one concerning Jerusalem sites from the Crusader period, and another on major biblical sites, including the City of David, the Pool of Shilocach and the Plaza at the Western Wall. Sounds like the lectures were interesting, although I would not be confident that the details are being reported accurately. At the end of the article, Kathleen Kenyon is turned into "Catherine Kenyan." Jim, Re your doubts about the accuracy of the reporting in the article on Dan Bahat. I very much doubt that, at stated, he emigrated to Israel in his late 30's. Forty two years ago he was a supervisor at Masada having completed a three year degree course at HU. If he had only emigrated in his late 30's he would then have had to have been about 40. Thus, today he would have reached the ripe old age of 82. Although its many years since I last met Dan I dont believe he's a day over 70! 1. You have "Pool of Shilocach". While some would call it the "Pool of Siloam", it should read "Pool of Shiloach". 2. You have "Caesaria" but it should be "Caesarea". 3. You refer to "Rev. Adolph Robinson" when it should be "Rev. Edward Robinson (1794-1863)". 4. You have "Nebuchandezzar" but it should be "Nebuchadnezzar". 5. You have "noted archeologist Catherine Kenyan" when it should be "Kathleen Kenyon" or "Dame Kathleen Mary Kenyon (1906-1978)". Grinnell, Ia. - There's no one else quite like Henry Wolfgang Morisada Rietz. The Grinnell College professor of religious studies, scholar of ancient languages and member of an international team studying the Dead Sea Scrolls would no doubt consider that the ultimate compliment. Rietz's work with the Dead Sea Scrolls began in 1990 when he was a graduate student at Princeton Theological Seminary, where he earned his master's degree in divinity and a doctorate in New Testament biblical studies. Among his instructors was James Charlesworth, a professor of New Testament language and literature and founder of the Dead Sea Scrolls project. Charlesworth quickly tapped Rietz to join his select team, which includes paleographers, archaeologists, chemists, imaging specialists, anthropologists and philologers from around the world. "He was extremely gifted academically, especially with languages and Hebrew theology," Charlesworth said. "I saw an outstanding, wonderful personality who was willing to do hard work. He's the most important person to me on the team." Rietz clearly views being involved in the project with the same excitement a UFO buff would have in winning an all-access pass to Area 51. 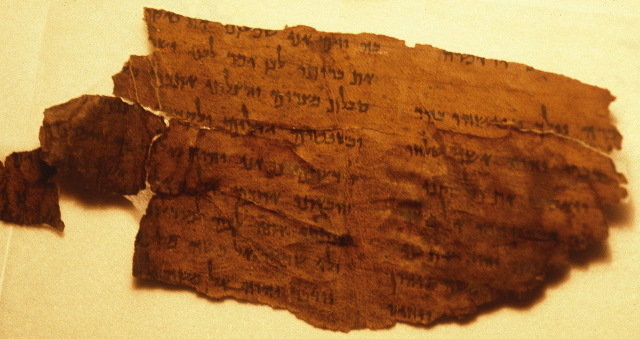 The scrolls have been a source of fascination and controversy among biblical scholars since 1947, when the first fragile leather and papyrus documents - which date before the time of Jesus - were discovered in caves around Qumran, about 20 miles east of Jerusalem. Comprising tens of thousands of fragments of 800 or so works, including the oldest-known versions of the Hebrew Bible, the scrolls offer a window into life in ancient Israel at a time when Judaism was in transition and a new religion - Christianity - was being born. The goal of the Dead Sea Scrolls project is to publish all the nonbiblical texts in 12 volumes, with the original language on one side of each page and the English translation on the other. Twenty-two years into the effort, they're halfway there. Serving as associate editor under Charlesworth, Rietz's main duty is to ensure consistency in the original-language texts and the translations, a task that pulls on his knowledge of Hebrew, Greek, Latin, Aramaic and Syriac. (IsraelNN.com) Out of Zion has come the world’s tiniest Bible, engraved in gold on silicon, to illustrate the science of nanotechnology. More than 300,000 words and 1,200,000 letters, including vowels have been placed on less than half a square millimeter, allowing the tiny Torah to fit inside the first dot of the first letter of a traditional Torah scroll. “We took a piece of silicon and evaporated a very small layer of gold over it, about twenty nanometers thick,” explained Ohad Zohar, a Ph.D. student at the Technion, on Israel National Radio’s Yishai Fleisher Show. A nanometer is about a billionth of a meter. What did you make this for?” asked Fleisher. “It is not for ordinary use, of course,” Zohar said. “To read it you need very expensive equipment. You cannot read it with a magnifying glass or even the best optical microscope. You need an electron microscope to read it. It is not intended to replace any storage devices out there. We did this as part of a massive educational program aimed at mostly high school students to explain different methods of storing information and spark an interest in Nanotechnology.” The project was sponsored and conducted at the Russell Berrie Nanotechnology Institute at Haifa's Technion Institute of Technology. “What does the future hold for such technology?” Fleisher asked. “The current technology is predicted to continue shrinking and doubling capacity for many years until some ultimate limitation is reached,” Zohar said. “Storing the same amount of information will take four times this area on a modern hard disk, and about 140 times this area on a triple layer DVD. Our nano-bible is [currently] a record holder. But in the future we can think about putting information, one bit per atom, on a substrip. On our Bible, we used 14 nanometers diameter for the smallest dot we had. So if we use an atom, the diameter will be only one tenth of a nanometer – two hundred times smaller. This is interesting. It is 160,000 times denser than our Bible. This is a gimmick, of course, but it's based on cutting-edge technological innovations that are likely to be important in more practical ways in due course. ARAMAIC WATCH: An ancient church in Iraq awaits proper study and reconstruction. Iraqis determined to restore ancient Al-Aqiser church - 1,500 years old - to past glory. AIN TAMUR, Iraq - No-one celebrated Christmas in Al-Aqiser church on Tuesday, for what many consider to be the oldest eastern Christian house of worship lies in ruins in a windswept Iraqi desert. But 1,500 years ago, the first eastern Christians knelt and prayed in this barren land, their faces turned towards Jerusalem. The remains of Al-Aqiser church lie in the windswept sand dunes of Ain Tamur, around 70 kilometres (40 miles) southwest of the Shiite shrine city of Karbala, forgotten by most. But some Iraqis are determined to restore the ancient edifice to its past glory. "It is a place of worship, a church, and without doubt, the oldest church of the East," said Hussein Yasser, the head of the antiquities department of the province of Karbala. "According to our research, it was build 120 years before the emergence of Islam in the region," Yasser said. "The church was built facing Jerusalem," said Yasser, who has been struggling since 1993 to attract funds and interest to restore the church and carry out excavations in the area. His efforts were briefly rewarded some years ago when the authorities agreed to finance a brief excavation that lasted six months. The work revealed an archway which he believes probably belonged to an underground crypt, bearing inscriptions in Syriac -- the language spoken by the first Christians. "I am sure there is a city underneath the sand," said Yasser, a Shiite Muslim. Ain Tamur police chief Mahfoud al-Tamimi said he agreed that Al-Aqiser must be saved. "The church does not belong to the Christians only or to the Muslims. It belongs to the world," Tamimi said. "The world must help us save it," he said, calling for the church to be added to UNESCO's world heritage site list. APRIL DECONICK may have gotten her Christmas present from the National Geographic Society. BEACHCOMBING NEAR CAESAREA: Somehow I missed this one from a week ago. A woman walking on the beach with her sister near Caesarea stumbled upon the 2,000 year-old bones of a Roman soldier, police said Tuesday. Julia Shvekky, 53, of Kibbutz Barkai was walking along the beach with her sister, Janet Daws, who is visiting from London late Monday afternoon looking for sea shells and mosaic pieces when they came across the ancient remains. "We were walking on the beach looking for interesting bits and pieces and we said to ourselves wouldn't it be nice if we found something really interesting," Shvekky said Tuesday. The bones - apparently those of a Roman soldier - had been exposed from a nearby Roman cemetery and were likely washed down to the beach-front during the recent winter rains, according to police. BEDFORD - As the sunlight streamed in through the stained-glass windows, the turtle doves glimmered a little, and the yellow torah scroll - stretched over Mount Sinai - came alive. The Tiffany-style windows depicting King Solomon's "Song of Songs" from the Old Testament form the backdrop for the ark, where the torah is kept, and the podium in the recently built secondary chapel at Temple Sha'ary Tefila. The windows were the result of a collaboration between Bedford-based artist Linda Altabef and stained-glass artist Doris Cultraro of Rhinebeck, in Dutchess County. When [Robert] Krasnow [co-chairman of the temple's buildings and grounds committee] approached Altabef to design the five panels, she had the perfect scene in mind. "I chose King Solomon's 'Song of Songs,' which Rabbi Akiva, one of the greatest sages of the Talmud, has described as the 'Holy of Holies,' " said Altabef. The song was composed by King Solomon as an allegory, she said, a duet of longing between the husband (God) and wife (Israel, "or the Jewish people"). Altabef, who owns a home in Israel and travels there frequently, said her imagery was inspired by her trips, and her love of Judaism. The turtle doves symbolize God's loyalty to his mate Israel, the herbs frankincense and myrrh were used in the incense burned in the Temple in Jerusalem, a window depicts the clouds of glory, which is thought to have protected the Jewish people during their exodus from Egypt. Cool. Follow the link for a photo. MERRY CHRISTMAS to all those celebrating. JERUSALEM — A worldwide hunt is under way for missing segments of the oldest and most reliable copy of the Hebrew Bible, nearly half of which disappeared 60 years ago during anti-Jewish riots in Aleppo, Syria. Although the effort has been under way for some time, it has accelerated in recent months. The Ben-Zvi Institute here is spearheading the effort and hopes to enlist the help of Aleppo's now-dispersed Jewish population, some of whom live in the U.S.
"We are appealing to the older members of Aleppo's once-great Jewish community, who are scattered throughout the world, to look for the missing fragments and bring them to us," said Zvi Zameret, the institute's director. Mr. Zameret said the institute has contacted Syrian Jewish communities around the world in search of lost parts of the codex. "We do not intend to compromise on this," he said. "It is in our highest and ultimate interest to find as many of the missing pages as possible." He said the request has spurred many reactions and responses. "In one instance, we received several pages that were willed to us by the late Shmuel Sabag, who had emigrated from Syria to the USA and settled in Brooklyn," he said. "No material compensation whatsoever was requested for sending us this precious material." My understanding was that Mr. Sabag gave them a single fragment, not several pages (see here). I wonder if the reporter got this wrong, or if there's more to the story. UPDATE (4 January 2008): More here. THE CALL FOR PAPERS for the 2008 Society of Biblical Literature meeting in Boston is available at the SBL website. The page been up for a while, but I've not mentioned before this. As always, there are many good sessions; something for everyone. Much of Strugnell’s most important scholarly work came in the early years of his collaboration with the Dead Sea scrolls editorial team in Jerusalem. There he showed a remarkable facility in assembling fragments, deciperhing badly damaged manuscripts, and identifying texts. His most significant publications appear in the DJD volumes devoted to 4QMMT (with Elisha Qimron) and 4QInstruction (with Daniel J. Harrington). In recent years he took a special interest in the Qumran wisdom texts and wrote several articles on their language and interpretation. As editor-in-chief of the Dead Scrolls project Strugnell sought to maintain the integrity and continuity of the project while opening it up and restructuring the team and their assignments. He included Israeli scholars such as Emanuel Tov and Devorah Dimant and worked closely with Elisha Qimron on 4QMMT. The great European scholars Florentino García Martínez and Émile Puech regard him as one of their teachers too. These distinguished students and scholars have gone on to train their students in Qumranology and Second Temple Judaism. In his modest way Strugnell was a remarkably effective teacher. THE dancing at Ali Baba restaurant in Fresh Meadows, Queens, began before dinner was served. A tuxedo-clad D.J. spun earsplitting Middle Eastern melodies set to reggaetón beats. On the dance floor, beneath a bronze chandelier that hung like an upside-down minaret, women in long dresses swung their hips and howled celebratory shrills. Men with their suit jackets removed stretched out their arms and wiggled their shoulders as they shuffled about. Small children spun in place and ran in circles. The few dozen revelers who had gathered on this Saturday night were Mandaeans, members of the oldest surviving Gnostic sect, one of a group of religions that originated near the first century A.D. Most of the partygoers emigrated from Iraq in the past few decades, coming from a region where Mandaeans have lived for 2,000 years. Gatherings like this one, held periodically for the 300 or so Mandaeans scattered around the New York region, along with similar events around the country, go beyond giving the diaspora a sense of belonging. They also allow young members of the community to meet and to kindle the relations that will perpetuate the religion, to which someone can belong only when born to Mandaean parents. On this night, the crowd had gathered in celebration of a religious holiday Mandaeans call the Little Feast. The faithful, who revere John the Baptist as a great teacher, and whose doctrines share elements of Judaism and Christianity, might have commemorated the event in their homeland by dressing in white and performing ritual baptisms in the Tigris River. But November temperatures in New York were not quite conducive to river baptisms, nor were any Mandaean priests living in the area to conduct such a ceremony. The celebration in the restaurant’s rented party room, which was decorated with fountains along stone walls and plastic palm trees strung with white lights, was a kind of modern alternative to the traditional rituals. Best wishes to the Mandaean community for 2008. This afternoon's e-mail brought the following sad news from Mary McNamara, VP of Union Theological Seminary in New York. Edwina Wright was a versatile Semitist who earned her doctorate at Harvard under the supervision of John Huehnergard. For many years she served as assistant professor of Bible and then as director of language instruction at Union. Win was a brilliant pedagogue who inspired love and devotion in her students, and also an empathetic and compassionate colleague. She had resigned her Union appointment last summer partially for reasons of health, but her sudden death was completely unexpected. While she was a gifted scholar and a marvelous teacher, she also was painfully modest about her own abilities and achievements, reticent about publishing and uninterested in self-promotion. I will miss her. Win Wright and I were doctoral students together in the Harvard NELC program in the late 1980s. We hadn't been in touch for many years and I didn't know she was ill. I remember well her self-effacing humor and her quiet determination to finish what she started. Professor Edwina Wright, received the B.A. from Douglass College, Rutgers University (1967), the M.A. from Eastern Baptist Seminary (1969), the M.Div. from McCormick Theological Seminary (1985), and the Ph.D. from Harvard University (1996). She joined the Faculty of Union Seminary in 1998 as an Assistant Professor of Old Testament and last year, began her new position as Director of Language Studies and Adjunct Professor of Biblical Languages. Her primary responsibilities in this position include the teaching of introductory courses in Biblical Hebrew and Biblical Greek and an intermediate level reading course in Biblical Hebrew. In addition to her regular academic teaching, Professor Wright periodically directs individualized courses in Biblical Aramaic and Ethiopic. She also administers the Hebrew diagnostic examination for Old Testament doctoral students and works with the Biblical Field in providing linguistic support for students taking the Biblical exegesis practicum. As Director of Language Studies, she assists Dean Hayes and Registrar Edie Hunter in planning for the Summer Biblical Hebrew and Biblical Greek courses. This past year, she worked with representatives of the Union Latino community and the Academic Office in the development of Union's first course to be taught in Spanish. The class, Spanish for Ministry, is a one-credit course being taught during the spring 2007 semester, which focuses on the development of conversational skills and the discussion of articles that highlight ministry within the Latino context. Prof. Wright's participation in the Union community has included: serving on Auburn's Kneeland Award Committee; support of the Black Women's Caucus and of Fierce, the caucus of gay and lesbian students of color; support of the Poverty Initiative primarily through invitations to Willie Baptist, scholar-in-residence, to speak to Biblical Greek students regarding Jesus' response to the poor; attendance at the Students of Color Retreats; and occasional participation in student-sponsored dramatic events. Prof. Wright's primary research interests include Semitic Philology and Historical Linguistics, particularly regarding the Afro-Asiatic language family. Her teaching has also included courses dealing with the prophetic literature of the Hebrew Bible. Wyn Wright, who died yesterday, was the first person to complete a Ph.D. with me. She was brilliant, perhaps the best language learner I have ever met; she could get the grammar down so quickly it was scary. And she always wanted to move on to another language; I first studied Amharic, Tigrinya, and Mehri because Wyn wanted to learn them, and so we worked on them together (with her usually several chapters ahead). She was a wonderful teacher, who will be greatly missed by many former students at Union and at Harvard. She had a beautiful voice, and would occasionally sing in subway stations. And she was one of the warmest, kindest, wisest people I have ever known. After deciding to leave Union last year, for health reasons, Wyn had moved in with her mother Mary. Mrs. Wright told a friend that she and Wyn had had a perfect time together until Wyn became very ill a short time ago. UPDATE (30 December): More here.